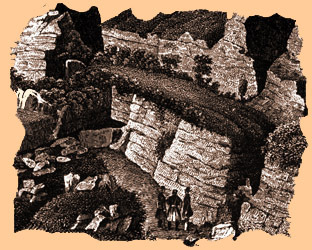 In France the first documented attempts at bouldering may have occurred in the 1870s. "In 1874 Ernest Cézanne created the Club Alpin Français in Paris. During hiking trips to the nearby Fontainebleau, its members discovered for themselves the magic of these sandstone boulders. As they fell under the forest's spell, they realized bouldering would be an excellent way to prepare for their future alpine expeditions." - Fontainebleau by Emmanuel Ratouis (translated by Katie Ives), in Alpinist 12, Autumn 2005. Groupe Rochassier was founded about 1910. 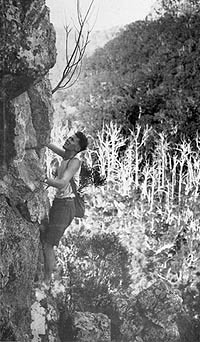 An energetic member, Jacques Wehrlin, had climbed his eponymous crack (5.8) in 1908. Ratouis goes on to quote Training, appearing in La Montagne, by Jacques Wehrlin (1913) : "Certainly these are not high pinnacles; the highest boulder does not exceed fifteen meters; but the sandstone is quite smooth and the holds are rare . . . Nowhere else could one better learn how to climb than here, with the help of microscopic roughness, infinitely small ledges and chimneys that would make the most hardened chimney sweep rejoice". After the end of the Great War, the Groupe de Haute Montagne was formed by Jacques de Lépiney, Paul Chevalier and others. Lépiney, in 1914, had raised standards by climbing the Fissure de la Prestat (5.8-5.9). But, a few years later the most famous boulder advocate in the early history of the area began to explore the craft. 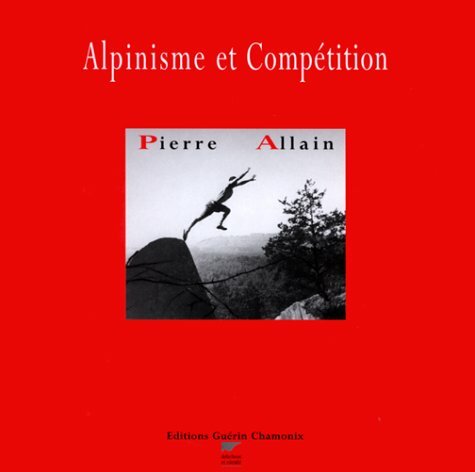 "Pierre Allain joined the GHM at the beginning of the 1930s. Very quickly he established prodigious feats, both at Bleau and in the Alps. In 1934 he established the first 5+ (5.11a) of the forest: L'Angle Allain . . ." - Ratouis. Pierre Allain, in 1935, invented the soft-soled climbing shoe for serious rock work. These looked a little like current footwear, but lacked the sticky rubber that was developed in Spain in the 1970s. He wore the shoes, that same year, for the first time in the mountains on an ascent of the north face of the Dru. In 1948 he introduced a new version of his shoe that was more attuned to extreme rock climbing. [Although I was unaware of French bouldering during the 1950s, I had heard of the updated versions of these climbing shoes, and I bought a pair late in that decade. Here I'm wearing them as I look over the start of a solo ascent of the Gnomon in the Black Hills about 1960. I also wore them on the Thimble in 1961.] Another member of "Le Groupe de Bleau" , Pierre Chevalier, introduced nylon climbing rope about 1943. At the end of WWII, climbers returned to the boulder forest, displaying a rebellious attitude spawned by years of Teutonic repression: "After the Liberation a new group, the Cuvier Academic Club, formed through the impetus of René Ferlet and Pierre Allain. The CAC dominated Bleausard climbing until the beginning of the 1950s." - Ratouis. Another club, the Club Olympique de Billancourt, appeared about 1950. "The best climbers of the COB soon overtook the CAC's 'very pure lights' . . ." - Ratouis. Nevertheless, Fontainebleau bouldering captured neither the attention nor the enthusiasm of most climbers for many years. "In the beginning of the 1970s, there were still few dedicated climbers in the forest". - Ratouis. Throughout that decade climbers continued to think of their activities as more a lighthearted game, whose preferred problems required technical imagination, but little real strength. Paradigms change, however: "In the beginning of the 1980s, the turning point of bouldering as we know it today began . . . This new generation . . . quickly adopted an athlete's logic about climbing. The availability of good problems, plus these climbers' intense motivation and training, all converged in a moment of fruition." - Ratouis. It is unfortunate that chipping holds was an accepted practice at Fontainebleau until the 1980s. Now, of course, it is forbidden. What would the Parisian alpinist be without "Bleau"'? Without the Sunday climbs on Bellifontaine sandstone? Very diminished, no doubt. Outside of Paris, beautiful limestone cliffs are found just about everywhere - and of impressive dimensions: the Dijonnais, the Calanques, the Ardennes, the Saussois… But us, we have our little rocks at Franchart, la Dame Jeanne, the Puiselet, Malesherbes, Cuvier. Cuvier, above all - that sacrosanct sanctuary, the very locus where free climbing is pushed to the maximum of current difficulty (let's not commit the future!). Here the routes - which are a great many, maybe five hundred for Cuvier alone, with a third being truly difficult - aren't measured in tens or hundreds of meters. Our scrubbing pan rocks, as a certain Chamonix guide defined them, are only a few meters tall. It's this that appeals to us and makes for the excellence of this school of climbing. With no need for laying out ropes, no long waits to tackle this or that difficulty, we move quickly from one to the other - only fatigue stops us and compels us to slow down. On these small rocks, quite close to the ground, we can let ourselves go, and - dare I say - outstrip the limits of our potential: the falls are of no consequence. If need be, we can try a given hard start twenty times in a row, learning thereby, with exactitude, the friction limits between rock and rubber. We can detect precise [sense] balancings, trust incredibly small holds and in this way acquire the qualities of a climber that are superior to those given by any other major school rock-climbing. Not that it isn't useful from time to time for the Bleausard to go put his knowledge to the test, [for him] to come into contact with long and sustained routes and get accustomed to the impressive verticality of [the] limestone cliffs. I hold it to be true that at the present moment, in free climbing, our best climbers can equal the best high limestone massif specialists on their terrain and that the converse is not the case. To date, no climber who is a stranger to Bleau has succeeded - and far from it - in surmounting our greatest difficulties. But, you'll tell me, the majority of the best alpinists don't frequent your "Bleau," and we've seen a number of Bleausards who were hardly brilliant in the mountains. Of course, but it's only a question here of pure rock-climbing; The mountains are much more complex. Many qualities besides those required by rock-climbing are needed, and being a brilliant rock-climber serves little when morale or route-finding ability for example are in default. Ice experience and technique also have to be acquired, and this is what the Bleausard lacks most often. Like the image of the chain that's no stronger than its weakest link, of all the qualities the mountains demand of the alpinist, it's the weakest one that limits the alpinist's pretensions. But since there's nothing preventing chance from bestowing the necessary gifts from time to time upon Parisians, having perfected their talent on our sandstone rocks can only be a positive advantage. And - to tell the truth - it isn't solely with an eye to mountain routes that we go to Bleau and climb there, it's above all because we make a game of it, one that arouses our passion in and of itself. It's good training? All the better, but even if that weren't the case, for the majority of us nothing would have changed. Every week we would find ourselves, just as assiduous, just as persistent, climbing a route that resisted our assault, and just as satisfied when it finally succumbed through our effort and technique. Like the games played in stadiums, there is rivalry among climbers, a friendly one, but a rivalry none the less. If, leaving the classics, one ventures so far as to try one of the "Cuvier's last great problems," and after many a "go" one of us triumphs over this prestigious four or five meter first ascent, he is momentarily just as proud as he would be had he just succeeded on some new route up the flanks of some great alpine summit. Whereupon, his friends get worked up for the second, the third, etc. There's no interest in that, you say? Perhaps, but the same goes for the tenth of a second taken off the time for the hundred meters, or the extra kilo lifted overhead by the weightlifter - for a car or a crane can do much better! To this passion for climbing, we can add the pleasures of camping and the benefits of thirty hours of clean air, during which, forgetting the cares of the office, workshop or sales counter, each Saturday we find once again and with the same intense satisfaction - you might even say the same need - the special atmosphere of our rocks and its group of habitués. This is where we often work out our summer projects and where we dare to speak of certain bogeymen, considering such ventures natural, even if it means revising our judgment when once in the field, in accordance with a formula I have for a long while made my own - audacity in conception, prudence in execution. 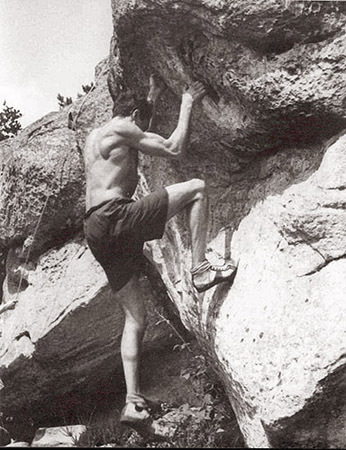 Fred Bernik, in 1947, designed the first formal bouldering circuits at Fontainebleau. Although useful as training for alpine routes, these delightful protocols became an end in themselves, giving rise to speed and difficulty competitions. For a fascinating and in-depth look at the history of this famous area, buy a copy of the magazine ALPINIST (12), Autumn 2005, and read the full text of Ratouis' excellent article. 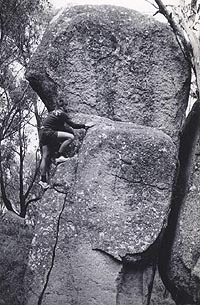 In Australia, initial forays into bouldering-type activities, in the Brisbane area, were made by the pioneer Australian climber, Albert A. Salmon in the 1920s and 1930s. Salmon avoided protective equipment and essentially explored his routes as a free-soloer, many years before that expression was coined. 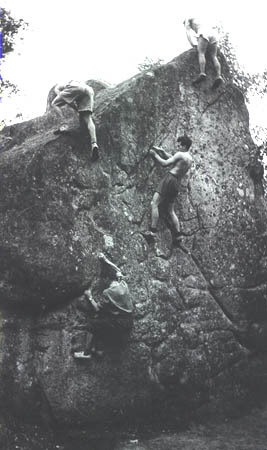 Here, on the left, he is seen making the first ascent of Egg Rock in 1927. 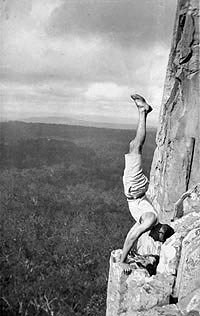 He also made the first solo ascent of Fly Wall at Katoomba in the Blue mountains near Sydney in 1934. Here, on the right, George Frasier is seen climbing Fly Wall in 1934 as Dr. Eric Dark coils a rope on top the cliff. Dark had challenged Frasier and Salmon to make the ascent, which is around 5.7. 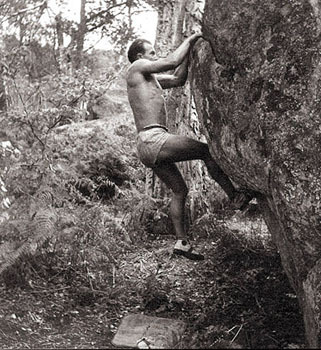 Modern bouldering in the Brisbane area - as in Germany - started in the early 1970s. 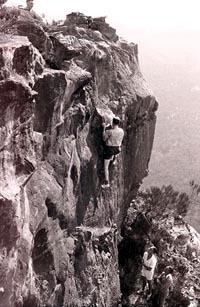 Ted Cais, who started climbing in 1962, was instrumental in introducing what we now regard as the sport of bouldering to that part of Australia. 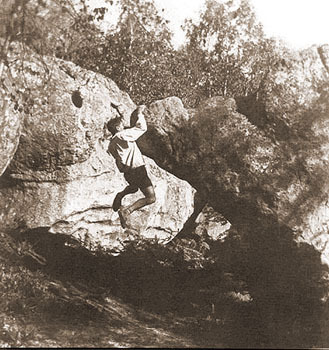 In the photo, here, Ted climbs on a granite boulder at Stanthorpe in that year. He has contributed the following article, giving us an intriguing look at the history of the sport around Brisbane.